What are the most popular online bachelor's degrees offered in Kentucky? Kentucky’s membership in the Southern Regional Education Board (SREB) provides ample resources for students pursuing a nontraditional route to higher education. SREB’s Electronic Campus -- which focus on adult learners -- makes searching for and choosing the best online colleges in Kentucky easy and stress-free for students. Students can browse through over 2,000 degree programs and 300,000 courses in 16 states, as well as learn more about financial aid for online learning. Online and distance learning is a top priority for the state of Kentucky and other members of SREB. The SREB Educational Technology Cooperative keeps its members at the forefront of e-learning changes and urges policymakers to designate online education a top priority in the South. With a focus on education technology, the SREB seeks to improve e-learning support and encourages innovation in the instructional technology space. Interest and enrollment in online higher education has been growing across the country. According to the Kentucky Council on Postsecondary Education, nearly 1 million distance learning hours were completed in the state in 2013, up from just 4,475 completed in 2006. Kentucky’s dedication to online learning makes it ideal for adult learners, full- or part-time job holders, and students with families to pursue advanced degrees. Students experience the flexibility and convenience of studying at their own pace from home, while avoiding traditional course-scheduling conflicts. Midway, founded in 1847, is a private, liberal arts college that was created to serve orphaned and disadvantaged women. The school has a catalog of more than 30 majors with programs recognized for excellence in equine studies, business, nursing, and teacher education. Midway is one of the online colleges in Kentucky offering accelerated undergraduate programs. Online programs are comprised of eight-week courses that are offered five times throughout the year. Students can earn bachelor’s degrees online in disciplines including business administration, education (with several concentration options), criminal justice, and health care. Midway’s Credit for Prior Learning program allows students to earn college credit for work experience and learning. Students transferring from the Kentucky Community and Technical College System have access to course advising and counseling. Midway offers an online MBA, minors programs, and an associate degree in business administration. The school uses Moodle for online learning. Asbury is a four-year, multi-denominational institution educating fewer than 2,000 students with programming that embraces academic excellence and spiritual vitality. Asbury’s 14 academic departments offer 54 majors at the undergraduate and graduate levels, including several master's degrees in education and an adult degree completion program called Adult Professional Studies. Asbury is among the online colleges in Kentucky that offers quality elearning. Programs are taught through the school’s own Asbury University Learning Platform. Students receive instruction from distinguished faculty and field-based practitioners as they build skills in areas such as inquiry, analytical practices, and assessment. The Online Degree Completion program for adults awards bachelor’s degrees in organizational management, ministry management, leadership and ministry, and education, which includes two areas of specialization — elementary education and instructional design. High students earn college credit online while still in high school through Asbury Academy’s dual enrollment program. Eastern Kentucky, founded in 1874, is dedicated to quality instruction, scholarship, and service. The school offers 108 undergraduate and graduate degree programs in the liberal arts, sciences, business, and other fields, including pre-professional and professional training. EKU is one of the online colleges in Kentucky offering bachelor’s and master's degree programs fully online. The programs are delivered through Blackboard with six start dates throughout the year. The BS in Corrections and Juvenile Justice Studies is one of the few programs in the U.S. devoted to adult services and juvenile justice. The Bachelor of Science in Fire, Arson and Explosion Investigations is a unique program that teaches the basics of fire science and how to process a crime scene. Other online bachelor’s include general studies, emergency medicine, homeland security, and paralegal studies. Online resources include library access, including the ability to chat or text with a librarian. Northern Kentucky, a growing metropolitan university located seven miles southeast of Cincinnati, has more than 15,000 students. The school offers three associate, 78 bachelor's, 23 graduate degree programs, and three doctoral programs. Its most popular bachelor’s degrees are organizational leadership, elementary education, communication studies, and accounting. Northern Kentucky has a student-faculty ratio of 17:1 and a NCAA Division I athletics program in soccer and basketball. NKU Online is one of the Kentucky online colleges designed for adult learners, with courses in eight-week and 16-week formats. Online bachelor’s degree options include business information systems, communication studies, criminal justice, health science, and integrative studies. Students with an associate degree in respiratory care can earn a BS in Respiratory Care degree online. Courses are offered through the Blackboard Learning platform. Students at NKU Online receive support through academic advising, access to the online library, and other resources. Morehead State pursues a mission of fostering student success, scholarship, diversity, and collaboration among its nearly 11,000 students. The school offers 140 undergraduate degree programs in areas including space science, graphic arts, music, and pre-med; Morehead has 70 graduate degree programs. MSU is one of the Kentucky online colleges providing many online options for transfer students. Online programs include a BS in Computer Information Systems (which can be earned in two years with the appropriate foundation), a Bachelor of Business Administration, and a BS in Technology Management, a two-year program for students with an associate degree in a technology-related field. Students studying business administration can specialize in areas including accounting and marketing. Through MSU’s Center for Student Success, students have access to First Year Programs, tutoring, academic advising, and other services. For online learners interested in campus life, MSU has approximately 100 clubs and organizations. Louisville, a research university located in Kentucky's largest metropolitan area, has 12 colleges and schools administering educational programs to approximately 22,370 students. UofL offers undergraduate and graduate degree programs, graduate certificates, and teaching endorsements fully online. One of the best online colleges in Kentucky, UofL Online Learning offers students flexible options to earn bachelor’s degrees in nursing, criminal justice, communications, and organizational leadership and learning. UofL’s OnTrack Bachelor of Science in Organizational Leadership and Learning focuses on healthcare leadership for healthcare professionals to capitalize on their existing experience. UofL Online Learning offers students the ability to study at their own pace and courses in an accelerated format. Distance learners receive one-on-one attention from faculty through phone and email and are expected to collaborate with classmates through forums, discussion boards, and other online tools. Online courses are not self-paced. Louisville uses Blackboard. Murray State University is a four-year institution recognized as a top public university in Kentucky and a highly ranked regional university in the United States. Through its six colleges and schools, Murray State offers 245 majors and programs in a variety of disciplines. Murray State, one of the best online colleges in Kentucky, provides online learning opportunities in an asynchronous and the occasional synchronous format. Murray State offers online bachelor’s degrees, master’s programs, and a variety of certificate programs. In addition, education endorsements, non-credit programs, and a seven-week GRE test prep program are available. Online bachelor’s degrees include business administration, computer information systems, telecommunications systems management, and RN-to-BSN. Murray State is also proud of its award winning online master of business administration (MBA) degree. Western Kentucky offers nationally recognized academic programs in journalism, engineering, education, and business to over 20,000 students. The school is home to an award-winning speech and debate team and the Gatton Academy for Mathematics and Science for exceptional high schoolers. WKU provides access to its programming through regional campuses and is one of the best online colleges in Kentucky. Fully online bachelor’s degree programs include criminal justice, RN-to-BSN, sociology, and healthcare administration. The school’s online 2+2 bachelor’s degrees, including business management and manufacturing engineering technology, offer transfer opportunities for students with an associate degree from any one of the schools in the Kentucky Community & Technical College system. Online students have the option of adding an undergraduate certificate to their bachelor’s degree in long term care administration, manufacturing and logistics, or geographic information systems. Distance learners have access to the online writing lab, online tutoring, and other resources. Tucked away in the Appalachian mountains, the University of the Cumberlands in Williamsburg is one of the best online schools in Kentucky. The university is a liberal arts college that offers a number of online associate, bachelor’s, master’s, and doctorate programs. Areas of study include business, counseling, criminal justice, health science, human services, information technology, education, psychology, and religion. Undergraduate online programs consist of 128 credit hours, and students are able to transfer up to 90 credits from another institution. The university provides students with affordable tuition and convenient program options. All online degrees can be completed at the student’s own pace. Courses take place in 8-week terms and have multiple start dates during the year. The general education curriculum provides students with a solid foundation for a liberal arts education, and the major courses prepare them for their professional work after graduation. Lexington is home to UK, one of the state's two land-grant universities. Through its 16 colleges and professional schools, UK administers about 200 academic programs to approximately 30,000 students. One of the best online colleges in Kentucky, UK offers a catalog of fully online and hybrid programs in disciplines including arts and sciences, design, education, and engineering. In addition to online master’s programs, an online bachelor’s program is offered in medical laboratory science (MLS) for students with medical laboratory technicians credentials employed in a hospital lab. Graduates can sit for MLS-level certification. Hybrid programs include the bachelor of health science in clinical leadership management. Distance learners have access to the Distance Learning Library Service and elearning faculty support. Online students are charged Kentucky resident tuition. Online courses are taught through canvas. Through The Distance Learning Library students can access print and electronics materials, research databases, and course specific guides. Brescia, founded by the Ursuline Sisters of Mount Saint Joseph in 1950, is a Catholic, liberal arts institution dedicated to the transformation of students through education. The institution offers undergraduate and graduate degrees in various disciplines through its six divisions and schools. BUonline is one of the Kentucky online colleges offering accelerated course programs for adult learners. Online programs offered in an eight-week format are flexible and affordable because of the institution’s competitive tuition rates and financial aid options. Bachelor’s degrees are offered online in fields including business, psychology, and integrative studies. Notable programs include the BA in theology with emphasis in pastoral studies and the bachelor of social work degree Completion program. The BA in theology is designed for church volunteers and ministers and the degree completion program is designed for students with 45 relevant credit hours and experience in the field. Located in Louisville, Kentucky, Spalding University is the most racially diverse private college in Kentucky. The university places a strong emphasis on compassion and inclusion for students from all cultures and backgrounds, making this one of the best online colleges in Kentucky for those seeking a diverse learning environment. The FLEX program at the university offers convenient online and evening classes. The program features seven different start dates throughout the year. Online students have access to on-campus resources, including the career center, math tutoring lab, counseling center, writing center, and academic advising. FLEX offers programs in the following areas: RN to BSN, psychology, interdisciplinary social sciences, interdisciplinary liberal studies, interdisciplinary humanities, health science, creative writing, communication, business administration, and accounting. The university provides affordable tuition to students, and 90% of students receive financial aid. Many FLEX students receive tuition remission. Spalding University was the first university in the region to offer programs tailored to adult learners and working professionals. Campbellsville, located in South Central Kentucky, is a private Christian liberal arts school dedicated to developing Christian servant leaders prepared for scholarship, lifelong learning, and active participation in a global society. CU offers undergraduate and graduate degree programs in fields ranging from the arts and sciences to business majors. CU, one of the best online colleges in Kentucky, offers five online bachelor’s degrees in social work (BSW), business administration, criminal justice, pastoral ministries, and RN-to-BSN. The BBA online has five areas of emphasis, including management, human resources management, and accounting. The online BSW is a degree completion program that can be earned in two years, depending on transferred credits. CU offers many financial aid programs. The school is Military Friendly Institution, offering reduced tuition to active duty military members pursuing an undergraduate degree online. CU offers online associate degrees and and a certificate in christian ministry. Kentucky State is a historically black, liberal arts institution with a mission to provide students with quality, student-centered undergraduate and graduate programming that integrates teaching, research, and service. One of the online colleges in Kentucky, KSU offers more than 50 online classes every semester. The school has three bachelor’s programs online: BA in Criminal Justice, BA in Psychology, and BA in Public Administration. KSU offers Interactive Videoconference Courses that are accessible at classroom sites in many schools, technical schools, colleges, and government offices in the state. The courses are regularly scheduled using two-way interactive videoconferencing technology where students can interact with professors on the KSU campus. Online services include Smarthinking continuous online tutoring services through Blackboard, an online bookstore, and online library. Distance learners can use the online library to search databases for articles, books, and journals, and get more familiar with Blackboard through the Blackboard UNV 101 library instruction course. Union College's Division of Online and Graduate Studies serves the needs of undergraduate, graduate, and continuing education students. Students, faculty, and staff are encouraged to grow intellectually, spiritually, and physically. The school offers undergraduate and graduate programs, and students can begin during any of the six starting points each year. Most programs follow an eight-week course schedule. Union notes the school’s affordability, with all students receiving some form of financial aid; in most cases, online students get access to textbooks and class materials at no additional cost. Union offers online master’s programs in psychology, business, and education, and an online chemical dependency counselor certificate. Programs are delivered through the uLearn learning management system. Online programs are taught through a convenient class schedule, and academic advisers are available for student success. If you want to qualify for a range of high-paying job opportunities, earning a college degree is key. When deciding where and what you want to study, you may end up weighing both in-state and out-of-state schools. If you are from Kentucky, there are many advantages to attending college in your home state. Sticking close to home can qualify you for in-state tuition and help you build a network of regional professional contacts. You may also benefit from your school's name recognition on the local job market, and you'll be relatively close by if you need to occasionally visit campus. When researching programs, be sure to consider our list of the most affordable online colleges in Kentucky. All of the schools in this list are accredited, and our rankings highlight the colleges that offer the best blend of affordable tuition and return on investment. A growing metropolitan institution of more than 14,000 learners, Northern Kentucky University provides students with a broad catalog of undergraduate and graduate programs. Online options include baccalaureate degrees in communication information systems, criminal justice, history, integrative studies, and nursing. Master's degree programs are available in business informatics, education, health sciences, nursing, and health informatics. NKU boasts a 17:1 student-to-faculty ratio, and online students receive additional support services such as tutoring. Transfer students must have a minimum 2.0 GPA from a regionally accredited institution. The school’s competitive tuition rate and generous financial aid make it one of the most affordable online colleges in Kentucky. Murray State provides prospective learners with over 120 academic options. Administered through six colleges and schools, the curriculum includes degree options that are taught entirely online by top-notch faculty. In addition to a well-regarded RN to BSN program, Murray State's virtual learning options include bachelor's degrees in business administration, computer information systems, and supply chain management. The school's online graduate degrees include master's degrees in agriculture, information systems, public administration, and business administration. Murray State also administers online education certificates and endorsements. The school is one of the most affordable online colleges in Kentucky and offers reduced tuition for residents in a handful states, including Alabama and Missouri. Home to the Wildcats, the University of Kentucky is composed of 16 colleges and schools that administer more than 200 academic programs. The school hosts a strong virtual learning campus for students at all levels. Bachelor's degrees can be taken fully online in fields such as medical laboratory sciences and nursing. UK also offers a wide range of online master's degrees in fields such as digital mapping, applied statistics, tourism management, distance education, and public financial management. Hybrid degree and certificate programs are offered in education, fine arts, health sciences, nursing, and social work. One of the most affordable online colleges in Kentucky, UK charges online students the same tuition rate as in-state residents. Auguste Rodin's "The Thinker" statue sits prominently on the UofL campus, serving as a monument to the institution's educational mission. The school's online learning options offer students the opportunity to be part of UofL's vibrant educational community, which comprises 12 colleges and schools and a diverse student body. UofL offers bachelor's degrees online in the fields of nursing, organizational leadership and learning, criminal justice, and communication. Graduate degree programs are also offered online in fields such as criminal justice, social work, civil engineering, and education. One of the most affordable online colleges in Kentucky, UofL's tuition is the same for online learners regardless of in-state or out-of-state residency. On its scenic campus located in Campbellsville, Campbellsville University offers undergraduate and graduate programs that prepare students for lives of service and leadership. The school's tradition of academic excellence is also available to virtual learners through CU Online. Undergraduate programs include bachelor's degrees in business administration, criminal justice administration, and pastoral ministries. The school also awards a broad range of online graduate degrees in areas such as sports management, theology, social work, and computer science. Master's degrees in education are available in several areas of emphasis including special education and TESOL. One of the most affordable online colleges in Kentucky, CU's tuition is the same for online learners regardless of in-state or out-of-state residency. Eastern Kentucky University has been educating students for more than 100 years and continues to expand its reach with distance learning. Ranked as one of the best online programs for veterans by U.S. News and World Report, EKU Online offers a comprehensive catalog of bachelor's and master's degrees in a wide range of disciplines. Notable programs include bachelor's degrees in the following areas: police studies; fire, arson, and explosion investigation; and child and family studies. Master's degrees are also offered in areas such as library science, public administration, and instructional leadership. EKU Online delivers online programming through Blackboard and offers six start dates each year. EKU's tuition is the same for online learners regardless of residency status, helping to make it one of the most affordable online colleges in Kentucky. Situated just 15 minutes from Lexington, Midway is a private, liberal arts college with career-focused academic programming. The school maintains a full roster of online baccalaureate teacher preparation programs. Prospective teachers can choose to specialize in a number of areas, including elementary education, middle school English, and secondary English and math. The school also offers online graduate degrees in business administration, education, and nursing. Courses are taught asynchronously through the Moodle learning management system in an accelerated eight-week format. One of the most affordable colleges in Kentucky, Midway is transfer-friendly and allows students to enroll at any time throughout the year. Master's degree students can transfer up to six credits to the school. On its hilltop campus, Western Kentucky University houses several nationally recognized programs in fields such as journalism, engineering, and business. The school also actively embraces applied research as faculty and students work to solve some of the world's most pressing problems. Distance learners can become "hilltoppers" through WKU Online and WKU On Demand, two virtual learning formats through which students can access 90 online degrees and courses at the undergraduate and graduate levels. Online fields of study include criminology, dental hygiene, healthcare administration, business administration, education, and public health. Support services for online learners include tutoring, student success coaching, and career services. One of the most affordable colleges in Kentucky, WKU provides students with a suite of financial aid options. Founded as a training college for teachers, Morehead State University is now a community of over 11,000 learners enrolled in undergraduate and graduate programs that span several disciplines. The school offers a student-focused learning community with small class sizes that encourage personalized learning. MSU eLearning options include undergraduate majors in accounting, technology management, computer information systems, and university studies. Graduate programs are available in fields such as English, career and technical education, communication, early childhood education, and business administration. The school is one of the most affordable online colleges in Kentucky, with more than 90% of its students receiving financial aid. A multi-denominational institution, Asbury University provides its small student body the opportunity to study, worship, and serve together. The school's virtual component is administered by the School of Graduate and Professional Studies and allows students to complete a degree completely online. Areas of study leading to a baccalaureate degree include elementary education, organizational management, and leadership and management. Master's degrees can be earned online in field such as business, social work, and communication. Institutional aid includes scholarships designated for transfer students. AU's tuition is the same for online learners regardless of in-state or out-of-state residency, helping to make it one of the most affordable online colleges in Kentucky. Kentucky State University, established in 1886, sits on an 882-acre campus and provides baccalaureate degrees in 24 disciplines and master's degrees in five. KSU's virtual campus serves a diverse student population, including working professionals, traditional students, and military personnel. The school offers three fully online undergraduate degrees in criminal justice, psychology, and public administration. Two graduate programs are also available in special education and nursing. Student services for online learners include online tutoring, an online bookstore, and an online library. KSU's online degree programs have the lowest tuition rates of any of the state's four-year institutions, making it one of the most affordable online colleges in Kentucky. Fore more than 150 years, students at Kentucky Wesleyan College have been educated in the liberal arts tradition. The school offers 29 majors and 13 pre-professional curriculums delivered in classrooms with a 12-to-1 student-to-faculty ratio. Several bachelor's degree programs can be earned fully online at KWC in the fields of business administration, criminal justice and criminology, general studies, and psychology. Online degrees are delivered in intensive seven-week terms to allow students to graduate in an accelerated timeframe. New terms begin every two months. The school is among the most affordable colleges in Kentucky and tuition is the same for online learners regardless of residency status. Lindsey Wilson College is a liberal arts, church-affiliated institution with a well-established undergraduate teaching college. Students unable to attend classes on the school's campus in Columbia can do so virtually through LWC's online programs. The school offers bachelor's degrees in fields such as business administration, criminal justice, human services and counseling, and nursing. Students can also earn graduate degrees in education, counseling and human development, and business administration. Support services include the Academic Success Center along with math and writing tutoring. Around 95% of undergraduates receive financial aid, Making Lindsey Wilson College one of the most affordable Kentucky universities. Founded by Ursuline nuns to accommodate the needs of World War II veterans, BU boasts a rich liberal arts and religious heritage. Meeting the needs of students means reaching them where they are. BU Online's options do just that with fully online programs designed for working professionals. The school offers baccalaureate degrees in the fields of accounting, business, psychology, integrated studies, theology, and social work. Master degrees are also available in management and social work. One of the most affordable colleges in Kentucky, Brescia's programs are competitively priced and delivered in an accelerated format so that students can save on tuition. Students throughout Appalachia and beyond attend Union for its strong academics, Appalachian heritage, and its core Methodist values. Union's Division of Online and Graduate Studies offers virtual learners undergraduate and graduate degrees in fields such as business management, law enforcement, and athletic administration. Online learning is delivered in eight-week, accelerated courses with six start dates throughout the year. Students with more than 24 credits can transfer into Union, where they are eligible to receive merit-based scholarships and need-based grants. One of the most affordable online colleges in Kentucky, Union also offers generous payment plans. Tuition costs in Kentucky have increased recently. In-state tuition in public 4-year schools has jumped by 38.2% over the past five years, while state spending on education fell by 1.5%. Accordingly, college students have increasingly turned towards online education options, where tuition and auxiliary costs are considerably lower. 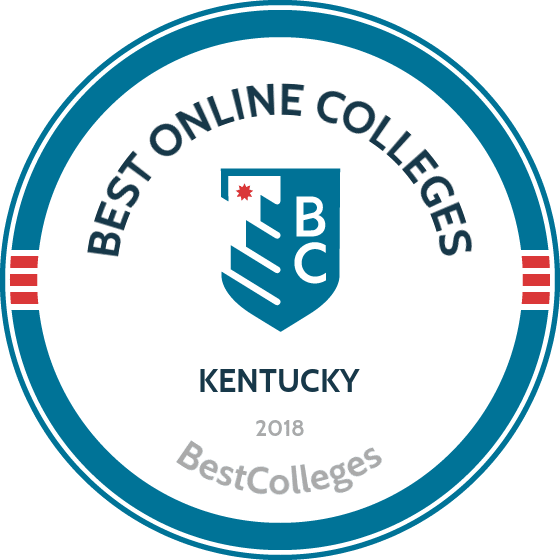 Browse our list of the best online colleges in Kentucky for more insight into distance learning programs in this state. Online learning in Kentucky has become significantly more popular in recent years, and online enrollments should grow throughout the decade. In response to the demand for web learning options, over half of the state’s accredited colleges and universities now offer online programs of some kind. To help bridge the gap in college graduation rates and the professional workforce, Kentucky's educational department is working to make online education more accessible. The Kentucky Virtual Campus (KYVC) helps by offering affordable college credit and professional program training to recent high school graduates and adult workers alike. This allows students to earn academic or continuing education credit online through the KYVC. In Kentucky, employment growth in this profession is strong. According to the Kentucky Center for Education and Workforce Statistics, long term projections show an increase of 52% in the total number of jobs between 2014 and 2024. Wages decreased by 1% from 2011-2016. In 2016, what were the top careers in Kentucky for people who had a degree in business administration and management? Data source: Kentucky Center for Education and Workforce Statistics, Bureau of Labor Statistics. Data may not be available for every year. Employment growth in this profession is strong in Kentucky. According to the Kentucky Center for Education and Workforce Statistics, long term projections show an increase of 40% in the total number of jobs between 2014 and 2024. Wages increased by 4% from 2011-2016. In 2016, what were the top careers in Kentucky for people who had a degree in registered nursing? Employment growth in this profession is strong in Kentucky. According to the Kentucky Center for Education and Workforce Statistics, long term projections show an increase of 52% in the total number of jobs between 2014 and 2024. Wages decreased by 1% from 2011-2016. In 2016, what were the top careers in Kentucky for people who had a degree in business/commerce? Employment growth in this profession is strong in Kentucky. According to the Kentucky Center for Education and Workforce Statistics, long term projections show an increase of 33% in the total number of jobs between 2014 and 2024. Wages increased by 14% from 2011-2016. In 2016, what were the top careers in Kentucky for people who had a degree in criminal justice/law enforcement administration? Employment growth in this profession is moderate in Kentucky. According to the Kentucky Center for Education and Workforce Statistics, long term projections show an increase of 6% in the total number of jobs between 2014 and 2024. Wages increased by 8% from 2011-2016. In 2016, what were the top careers in Kentucky for people who had a degree in criminal justice/safety studies?